I get a few emails a week about the growth and success of Lexi’s Clean Kitchen, how exactly I went about it, and if I have any tips or advice for new bloggers. Even though it’s sort of unrelated to my food blog, I’ve been thinking about bringing a blogging resource series here; and after high demand through a recent poll on my Facebook page, I decided to go for it. I will be sharing all types of advice- from mistakes I’ve made, my favorite plugins and things that I use daily, to things they don’t tell you when starting a blog, and so on. To get there though, we need to go back to the basics today. If you follow this post. In five steps you’ll be ready to publish your first post on your brand new blog! Figure out your blog name and buy the domain! For many this might be the most difficult part- picking a name that you will ultimately stick with- it’s tough, but have fun with it. Think of something that defines you or the message you are trying to convey and then give it a quick search in the Bluehost search bar, to make sure it doesn’t already exist. Buying a domain is generally pretty cheap, which is great. So… you bought your domain. What now? The next thing you’ll need to do is get your hosting. Hosting is just how your website is accessible to people on the internet. It sounds complex, but it doesn’t need to be. There’s a number of different companies you can host your website with, and many of which make it pretty simple where you don’t have to think about details too much. I recommend starting out with a trusted company like Bluehost. They are extremely reasonably priced and super helpful. You can find all you need for hosting with them by clicking here. I currently host LCK on private servers and host privately due to high volume of traffic- but I started out in a similar package as the ones below, and they are perfect. These are the available self-host options with Bluehost. So, you have your domain, you have your hosting, and now you’re ready to build your website and have some fun customizing it with a theme. My tip: When I first started LCK, I went with the free WordPress version, WordPress.com. Months later I realized that I was extremely limited in what I could do with the free one, and had to switch over to the paid version. This was beyond a huge pain. Like huge, seriously. I lost content, had to start a new design, etc. Go for the self-hosted WordPress.org over WordPress.com. Trust me. So, once you’ve signed up with the hosting, Bluehost makes it super simple. You can literally scroll down and with a click of the button install WordPress right there. Easy breezy. You’ll get an email confirmation with your login, create a password (write it down), and just like that… ready to go! Note: Your login URL (how to get to the backend of your site) is generally your domain/wp-admin (for example: lexiscleankitchen.com/wp-admin). Make sure during the installation process you have the correct login and password written down. GO AHEAD! Log in to your spankin’ new website. It’s yours, you are officially a blogger! Next you’ll get pick a pretty theme. You can find a list of them here, and by list I mean thousands upon thousands- so you’ll probably spend some good quality couch time checking out all the awesome layouts and deciding on a few of them before making an actual decision. There are free themes and premium themes. Premium themes, such as those on Elegant themes, are ones you pay for. They offer more customization options and more unique designs! You are so close to writing your first post, can you feel it? One last step, and a few tips away! Plugins and content layout are next. This will take you as little or as much time as you choose to put in it initially. Maybe you already have a logo and a color scheme ready to go, and all you’ll need to do is some formatting and writing, or maybe you are starting from scratch! Be prepared to possibly spend a good amount of time getting this step ready for the world to see! Simple Recipe Pro: There are many recipe plugins you can use, whichever you go with, just make sure they are optimized for Google. SRP is the plugin I developed and it is fabulous! My favorite feature is the global affiliate linker! Pin it for images: This puts a handy “pin it” button on every image so people can easily pin to your site- P.S. Pinterest is a huge traffic driver (I’ll get into this in a future post). Lastly, when I say content layout I just mean that you’ll want to organize your pages. You can do that under Appearance —> Menus. For example: add an about me page, a contact page, etc. These are important so your readers can put a name/story/face behind your blog, and for them and potential clients to have a way to reach you to ask you questions/inquire about a media kit (more on this in a future post)! Now the fun really begins! You are ready to write your first post, whatever that may be. Along with writing your first post, you’ll want to get on that social media grind. By this I mean… you probably don’t already have a social media following (I’ll talk more in the future about how I started blogging from my Instagram account). Utilize what you already have aka PROMOTE IT TO EVERYONE YOU KNOW. It’s okay to be a little annoying, your friends will jump on board and support you. So, was this helpful? Do you have any blogging questions you want answered? I have some posts lined up I think will be helpful, but am looking to hear more of what YOU want to see! Stay tuned for the upcoming weeks where I’ll talk about how I started and grew a blog through social media, blogging resources, food photography, things they don’t tell you when starting a blog, and so much more. If you’re interested in these types of posts, subscribe via email below. 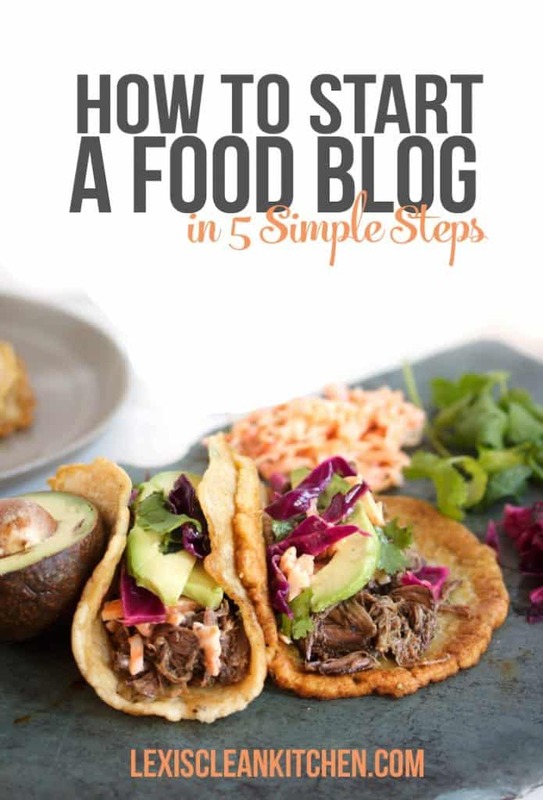 You can choose to subscribe for recipes, for blogging resources posts, or BOTH! Thanks for the great tips! You know my blog wouldn’t exist without your help. PS I made your pumpkin biscuits last night. They’re soo good! Ooops – didn’t see the end of the comment. So happy!!! 🙂 Enjoy ’em. Great post! Looking forward to more as I am beginning my own site! I am still a bit confused about why you chose Bluehost over hosting directly from WordPress as it seems the two link. Could you explain? Thanks for all the wonderful content! Thanks for this. I have several friends who need this…and will same me some explaining time! I am so excited for this series! I have a food blog that is close to a month old, but I am still having a hard time figuring it all out. I think I picked a WordPress theme that isn’t very customizable, and I’m regretting my choice. There are a lot of things I want to change but have no idea how to. I also am having a hard time reaching people, so I can’t wait to read what you share about that. My Facebook page for my blog has less than 200 likes, and I think my posts only reach a small fraction of those people. I don’t have a twitter account – do you think that’s necessary? Ugh this is super helpful. I started my blog last week on WordPress.com. I think I’m going to have to switch it over ASAP to something more accessible! We’re working on a huge post on how to switch it over. My tech expert will be guest posting about it! Stay tuned. Lexi…thank you for this post. I am a fairly new blogger and found this post to be extremely helpful and filled with bits and pieces I never knew. Is there anyway you could expand on Google analytics!? I’ve set myself up on their site but have no clue how to proceed with my tracking id! I am also very bad with code and any information you can share about how to easily sign up for and implement good analytics to track my stats would be awesome! Thanks in advance! Okay, I’ve made it to step 3. What I can’t figure out is how to know which WordPress to download. Is it safe to assume that the free is the free .com version and all the paid options through Bluehost and/or Mojo are the.org versions? I have emailed both of their customer service departments and have gotten no answers. I highly recommend paying for .org instead of .com. .COM is the free version. Hi, Lexi! Thanks for this post. I am slowly, but surely working towards creating my very first very own BLOG! I am so excited to explore the blogging world and share foodie eats, fitness tips, lifestyle posts, and much more to everyone out there! Finally got the courage to move from wordpress.com and invest in a self-hosted wordpress.org site after nearly 3 years of being on a blog. Thanks so much for all the information! So glad it has helped! I was wanting to start a blog, however, when I spoke to my daughter about it she said that I would have to pick a type of blog and stick with it. Is this correct? I was thinking of do a blog every week on just what happened to intereset me that week, as I tend to enjoy learning and love to share. It confused me as too why I could only do say a cooking site or what ever, why can it not be a more open forum. TY for the info you provided. It is great. That’s a very fabulous article. I really like this thanks, buddy, to share this .all the best keep up the work. I’m so new to blog’s world and I’m starting building my food blog (if you can see in my website). Reading your articles is really useful to me and I’m in Step 6 ;). I have some friends to help me develop my blog too. I would love to make friend with you and it’s so great if I can get some opinions from you about my blog.